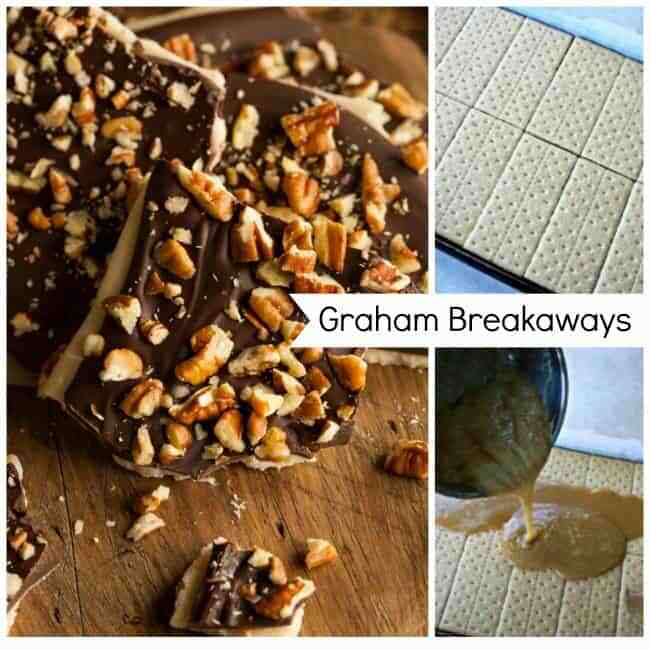 Graham Breakaways, similar to saltine cracker toffee also known as “Christmas Crack” during the holidays – except these use graham crackers. Christmas is fast approaching and though I love giving homemade goodies to my friends, family, and neighbors, I’m not a fan of doing a marathon baking challenge the week before Christmas. So, near the end of November, you can find me in my kitchen, making Christmas desserts. Most cookies and squares freeze very well, so I bake and freeze as I go. It eases the stress of the holidays, knowing that I can focus on shopping and menu planning, the week before Christmas. And I love having holiday desserts, for those unexpected guest, during this time of year. These cookies are super simple and freeze beautifully. They are also very versatile; simply choose the nuts and chocolate chips you prefer and you are all set. This year I went with some slivered almonds and red/white/green chocolate chips/ sprinkles. 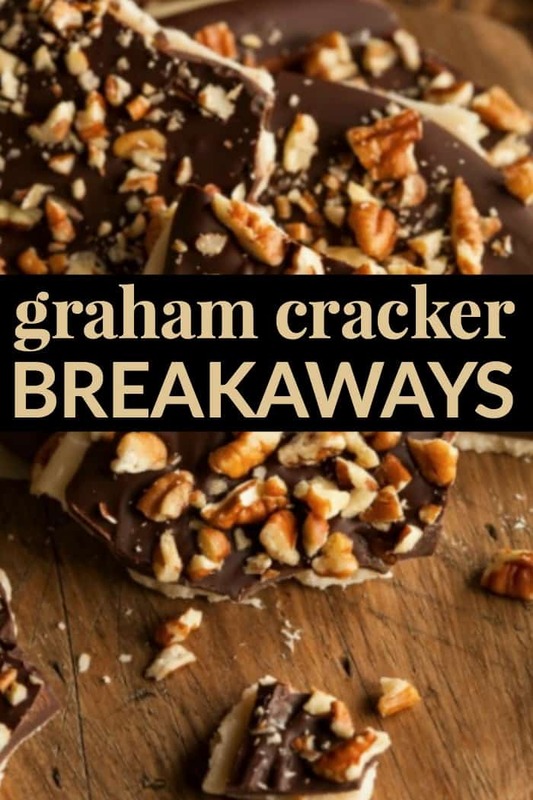 These are similar to a popular recipe for Saltine Cracker Toffee Cookies, but I love the graham crackers best. Author: Cindy ~ Hun…What’s For Dinner? Line a rimmed baking sheet with parchment paper and place graham crackers side by side, on the parchment; set aside. In a small sauce pot, melt the butter and stir in brown sugar. Bring to up to a boil and boil for 3 minutes. Pour over graham crackers and spread out evenly, with a spatula. Sprinkle evenly with nuts and chocolate chips. Bake in preheated oven for 6-8 minutes; until sugar is bubbly. Remove from oven and let cool completely, before breaking into pieces. Store in an airtight container for up to 2 weeks. Can be frozen for up to 6 weeks. Cindy is a Stay at Home Mom of 2, married to a Chef. Cindy quickly realized that if she didn’t want to live off of cereal, blue box Mac’n’Cheese and TV dinners, she needed to get into the kitchen; after a long day at work, the last thing her hubby wants is to cook her a 4-star dinner. When her son turned 2, she decided to start blogging and Hun… What’s for Dinner? was born. Cindy tries to share healthy and wholesome dishes, with a few desserts here and there. Though baking is her passion, she has recently become more adventurous in the kitchen and loves creating new and innovative recipes. That is a great idea! It looks so easy to make too! My kids would love this! They’re all for something tasty and colourful, and I like that it does not look very hard to make! Always have them on hand as a quick snack. I made something like this a few years ago for Christmas presents but it was with chocolate. So yummy! I may have to make them again this year. This sounds like a treat that both my children and I would enjoy! I think I’m going to put it on my roster for cookie baking this year. Thanks for sharing! Cindy always has inspiring recipes. This one look delicious and very easy to make. Thanks for sharing! we make something similar with soda crackers, it sounds weird but they are so good! This is a great recipe and idea, my kids would love this. Have to try it, thanks for sharing it! YUMMMY! this looks really yummy! I will have to give this a try! I will try this recipe. Looks lovely. Was thinking about adding mini marshmallows — s’mores?